For John’s birthday, which happened to fall on the same week as my finals, I decided to make veal breast – it’s probably the cheapest cut of meat that gets overlooked because most people are unsure as to how they should prepare it. Well head to your butcher, because this is easy. Just ask him to remove the bone, and pound the meat flat – without the bone you should have 1lb of meat for 2-3 servings. This recipe easily doubles or triples, and it will give you plenty of time to prepare other courses. Place the meat on a large enough cutting board to lay it out. Season with salt and pepper. Make 6 slits in the meat, and slip in the garlic. Lay the slices of pancetta evenly over the veal breast and sprinkle with rosemary, thyme, and parsley. Roll the meat up tightly like a jelly roll, and tie it with butcher’s twine or a foodloop (I love mine). In a Dutch oven, heat the olive oil over high heat. Once it starts smoking, sear the veal roll until golden brown all over, this may take about 15 minutes. Remove the meat and set in a bowl. Add the onions to the Dutch oven, and lower heat to medium-high. Cook until golden brown and soft. Stir in the chicken stock and wine, and make sure to scrape up any meat or onions the bottom on the pan with a wooden spoon. Return the veal and any juices to the Dutch oven, and bring the liquid to a boil. Cover tightly and bake in the oven for 2 hours. Remove the Dutch oven from the oven, return to the stove on high heat. Take out the veal and place on a cutting board for about 5 minutes to rest. Bring the liquid to a boil, and allow to reduce and thicken. Remove the butcher twine from the veal and slice into 1-inch medallions, serve over rice or pasta, and top with onions and juices. Serve with a lightly dressed salad, and some champagne. I wasn’t feeling the chicken I had taken out of the freezer last night, and I had time to make gnocchi. The rest came from what I had in the fridge and pantry – it was awesome! Stir together bread crumbs, salt, and 1 tablespoon oil in a small bowl until combined well. Transfer to a large saute pan and cook over medium heat, stir until crisp and golden, about 3 minutes, then return to bowl. Heat the remaining 1/4 cup oil in the same saute pan over medium high heat until hot but not smoking, and saute cauliflower, stir occasionally until well browned. Add bacon and saute, stirring frequently, until just beginning to crisp, about 2 minutes. Stir in the garlic and red pepper flakes and saute for a minute. Add stock, reduce heat and simmer while keeping partially covered, stir occasionally, until cauliflower is tender and sauce is slightly reduced, about 10 minutes. While sauce simmers, prepare gnocchi. Stir gnocchi and half the cheese into the sauce and simmer for one minute. 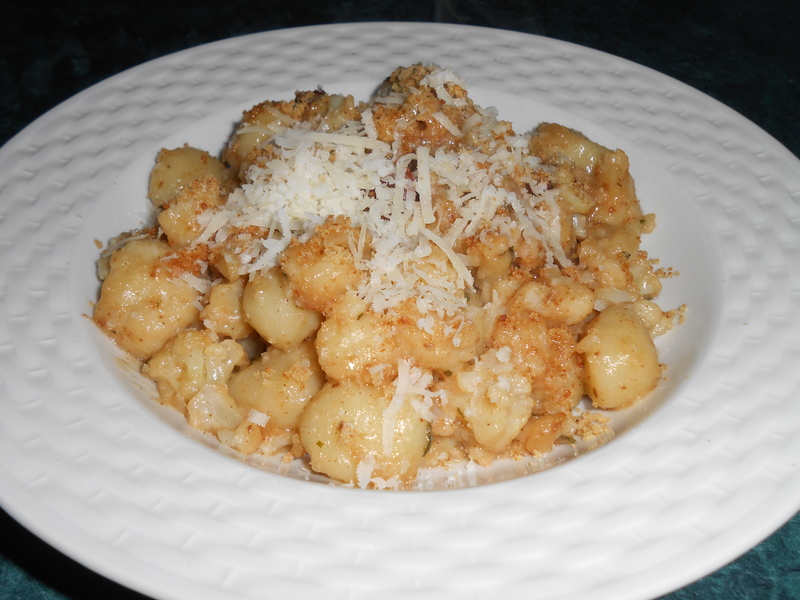 Pour gnocchi and sauce into a large serving bowl, sprinkle with parsley and bread crumbs. Serve with a bowl of grated pecorino and a glass of wine! My sister came to visit this past week, and her favorite cookie is oatmeal. She told me she wanted a crunchy outside/chewy inside – and not a ton of sugar. She and my husband John ate all 12, over 10 days. She asked me for the recipe, so I posted it on here in the same way I emailed it to her (don’t ignore the notes). I froze them before she arrived, and refrigerated 1/2 over night before she came – we baked them whenever she wanted them. I hope you enjoy with a scoop of ice cream, and a tall glass of cold milk. You will need a scale – I learned from a local chef that you are better off measuring everything in weight for cakes and cookies, so I’m going to try and do that from now on. Let me know if that works for you, I can include measurements in cups also. 156 grams walnuts, chocolate, raisins – whatever you like, or mix them. In a large bowl combine flour, cinnamon, baking soda and salt. In a small bowl whisk together brown and white sugar, break any lumps. In the bowl of a stand mixer, fitted with a paddle – cream the butter on medium speed, until it looks like mayo. Scrape down the butter, add the sugars and mix for 5 minutes, or until fluffy. 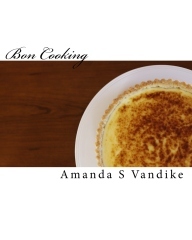 Scrape it down again, add eggs and vanilla bean, and mix high speed for 10 secs. Don’t over-whip or the cookies won’t be fluffy, they will bake out flat. While the mixer is on low, add half the flour mixture and half the oats. Wait until its thoroughly combined, then add the rest of the flour and oats. Add your walnuts, or whatever thing now, and mix. Divide the dough into 12 equal parts – weigh out 72 grams each. Roll into balls, in your hands, place in a container lined with parchment paper, refrigerate for at least 30 minutes. Or freeze, if you freeze the cookies, place them in the refrigerator the night before baking them so they defrost. Preheat the oven to 325 degrees F, and bake 3 or 4 cookies on a silpat lined baking sheet, give them space, they will spread out. They will store in a container, but they are best freshly baked.